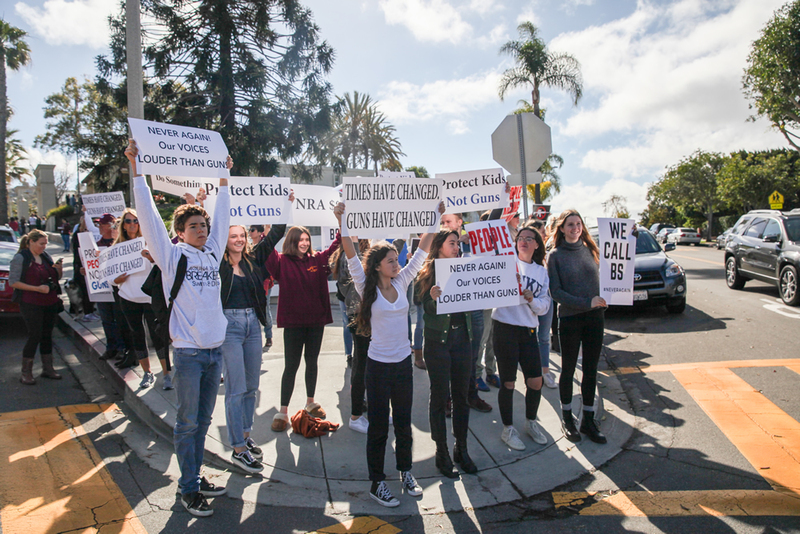 Laguna Beach High School students found themselves torn between two options for participating in Wednesday’s nationwide walkout to protest gun violence—stay in the school’s quad and take part in an organized break period, or march out of the school and join a more politically-charged peaceful protest at the corner of Park Avenue. The national school walkout took place from 10 a.m. to 10:17 a.m. on March 14, marking one month since a 19-year-old gunman killed 14 students and three faculty members at Marjory Stoneman Douglas High School in Parkland, Fla. The reaction to the horrific shooting was felt throughout the country, including in Laguna Beach. At a recent public meeting, Police Chief Laura Farinella spoke about a detective’s assignment with the school district and the department’s participation in active shooter trainings. Farinella also encouraged people to report something out of the ordinary. “I will tell you here in this county, when people do that, we act on it immediately,” she said. On Feb. 13, the school board approved its 2018-2019 Comprehensive School Safety Plan, which includes preparing for and responding to an active shooter scenario. Neither police nor school administrators could estimate the number of instances when school lockdowns have occurred. None have taken place in the current school year. Of the students who joined the walkout Wednesday morning, at least six were under the impression that they would be marked truant for their actions. Juniors Jordan Glick, 16, and Iris Sewell, 17, were two of the first students to join the group of parents at the corner of Park Avenue. Both thought they would be punished for walking out. “Laguna Beach High School has tried to stop us from protesting and leaving campus,” Sewell said. “They’ve twisted the 17-minute walkout into a 17-minute free period where we can do what we like. Brittain Sammons, a 17-year-old junior, said she wasn’t concerned about truancies. When asked why the walkout was important to her, Sammons choked back tears as she spoke of the “innocent kids” who died in Parkland. Despite the ramifications that some students and parents expected, Connie Byrnes, LBHS campus supervisor, said students would not be given truancies for walking out and standing at the street corner, since the sidewalk is still considered part of the school’s campus. Byrnes said all students were allowed to exit the building and walk around, just as they are with any other regular break. As dozens of students and parents stood outside with signs and garnered supportive honks from passersby, Byrnes said students who chose to remain in the quad were able to participate in a one-minute moment of silence and were also able to talk to counselors or write their thoughts down on post-it notes, which were then placed on large poster boards throughout the quad. Junior Logan Ledger was one of the students who opted to stay in the quad area. Ledger said she wanted to avoid a potential truancy, and she also didn’t agree with some of the political views associated with the walkout. A few students did decide to stay at the corner after the allotted 17 minutes. Sammons said she had a free period following the break, but sophomore Charlie Besso, 15, and junior Hanna Hardie, 17, said they were missing their next period and would receive truancies for staying. “A protest should be taking a stand, even if you have to face consequences to show that you don’t agree with what’s going on,” Besso said. BRAVO to the students of Laguna beach Highs School for participating in this national event! And one big “BOO” to the Laguna Beach School District for organizing an alternate event for “remembrance..” You FAILED the test Laguna District. Laguna School District you had an opportunity to be a part of a huge movement to put peoples lives before profits, and you didn’t. Anther “F”. One of the main tenant of the March 14 Walk Out was to highlight inaction, passive players and the belief that thoughts and prayers are enough. You didn’t do your homework Laguna District. Your response was insufficient and lackadaisical just like those in Congress and the White House within the deep pockets of the NRA. “F, F, F”. And no you can’t take the test again, administered ONCE and you FAILED miserably. And who wrote the confusing email???? 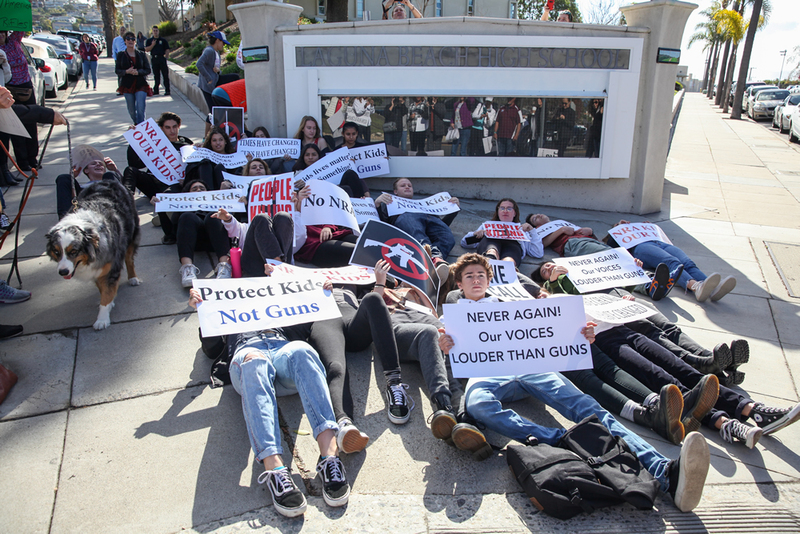 Another fail, But yet the youth shines bright and true: Kudos to all who joined the Walk Out, now on to the March For Our Lives March 24!!! It was good to see that Laguna’s students are as well informed and articulate as the many around the nation. I am so proud of our young people. They give me hope that things will get better and common sense will prevail. On the other hand, the LBSD was a big disappointment. It seems to me that the “new” superintendent came to the wrong district. I think he should consider moving on as he doesn’t seem to fit here. His was a very heavy handed approach. Thank goodness the students were a step ahead of him. @Theodore Schraff thank you for your kind words and support for the LBHS students. As for the way the walk out was handled we feel the same. I personally agree with Charlie Besso, who said, “A protest should be taking a stand, even if you have to face consequences to show that you don’t agree with what’s going on.” There need not be a District-organized event, and bring on the consequences! Brilliant insight, Charlie. Parents and Educators, take note. We are very proud of LBHS students, including our granddaughter, for being part of this new wave which will hopefully bring sanity to Washington once & for all. N. California & W.Cape, S. Africa. Not really at the forefront of academic achievement this is just letting the political community use our children for their own means, would have been a great opportunity for learning what the actual gun laws are and what the interpretation of the 2nd amendment to The United States Constitution is and what it actually protects. More students are snuffed out by substance abuse and automobile accidents than all wars combined give respect to your emotions and keep the ideologies on track and in focus and don’t let media fashion your lives or your goals.